On Wednesday I was invited to check out the new F&F Boutique (before it’s official opening today) which is situated on a modern mezzanine overlooking West Cromwell Road. It’s not at all what you would expect from the typical clothing range within a supermarket. Hats off (literally, check out the lighting!) to the F&F team for pulling this one off seamlessly. The boutique itself is large and spacious with a layout and style that you’d expect from a stand alone store. The staff are beyond helpful and the collections have certainly gained my thumbs up! You can also shop the online exclusives from the first London F&F Online Kiosk, which enables orders to be placed for the full extended online range. Whatever you’re style I really would urge you to take a trip to this store, it’s a taste of what’s to come for the future of F&F. Anita Bolger, Brand and Marketing Director of F&F comments “This is an exciting chapter in F&F’s journey with the opening of a central London, dedicated ladieswear boutique. 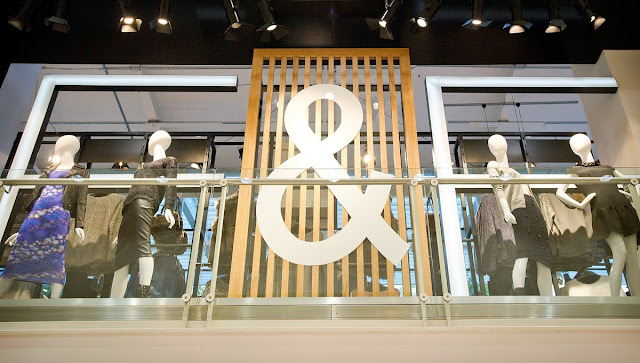 The interiors created for this store bring to life the F&F collections in a modern and inviting way which will enhance our customers shopping experience”. Also check out the catwalk show from their AW13 collection here on YouTube!